Say "Hello!" to DolphinPro 7.3 Beta in the new Chat! Andrew Boon posted 27th of January 2016 in Dolphin.pro News. 29 comments. DolphinPro 7.3 Beta is available for download. We are about a month ahead of the planned schedule. In the last few months we managed to re-arrange our support and development, so that we can now deliver better technical support and version updates in-line with the development roadmap. Yeah! Next, we're continuing the bug-squashing crusade. In 7.3 we've got rid of 62 of them pesky pugs and hope to catch some more during the beta-season. 62 bugs fixed: see full list on GitHub. - Payment: reCaptcha for "payment before join"
This is a BETA release. Not recommended for production sites. We provide upgrade patch for 7.2.1 to 7.3.0.b1, but you'd be better off making a clone site and upgrading for testing purposes only. We will be offering beta-to-release upgrade patch as well, but still we don't recommend updating production sites. The easiest way to try things out is to play with the online demo. It has Chat+ installed as well, so come and say "Hi!". A really good chat is a big challenge. It has to be cross-platform, responsive, scalable and fast! After a long and painful deliberation we decided to take what we believe is the most promising and powerful chat in the world, integrate it with DolphinPro and commit to full support of the package. We've chosen Rocket.Chat. 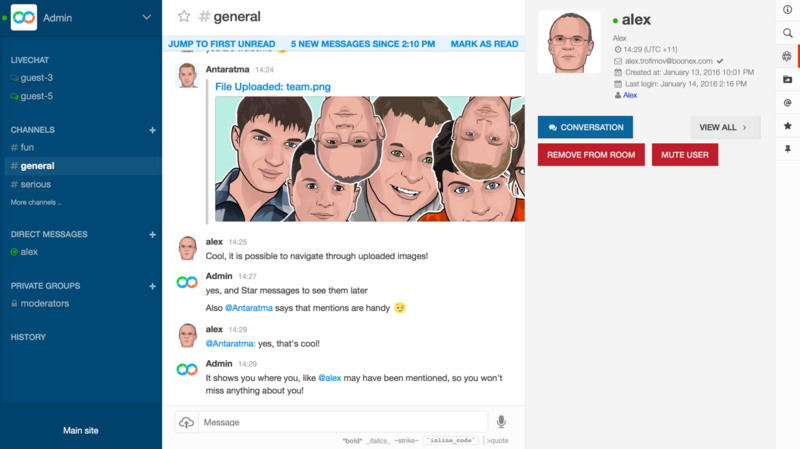 Rocket.Chat is an open-source MIT-licensed product, build on Meteor platform. It's a relatively new system, but we believe that it has made all the right choices in terms of technology, licensing and features. In other words - it's awesome! 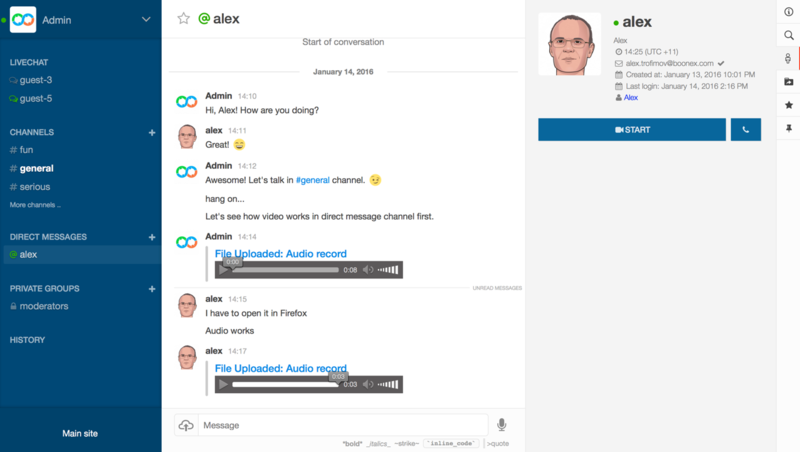 So, DolphinPro now has a new chat, integrated with the site, using WebRTC API, supporting audio/video conferencing, voice messages, file-sharing, help-desk chat and even sporting accompanying native desktop apps and mobile apps. It's truly a future-proof chat with huge potential. We plan to further improve level of integration of Chat+ in DolphinPro in every new version update. 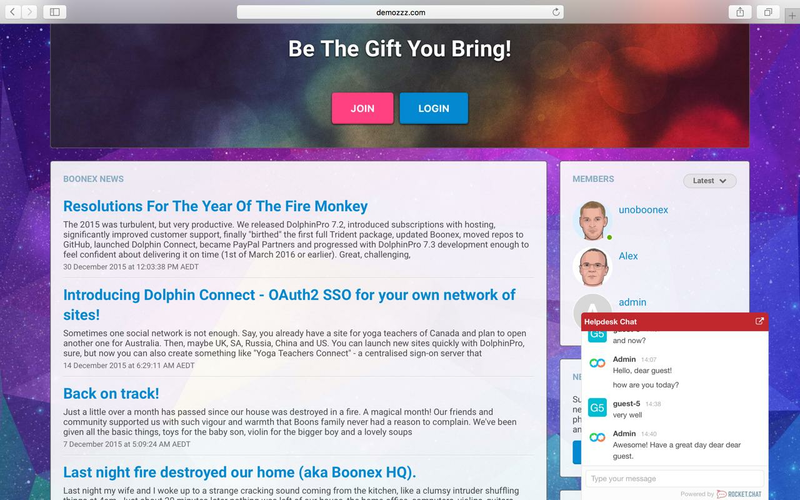 At this stage we have integrated authentication (powered by Dolphin Connect); avatars; usernames; site back-link and profile meta-data. Also the HelpDesk chat window is integrated for non-authenticated visitors (authenticated are supposed to use the chat itself). Tomorrow we'll put out files and installation instructions for the Chat+, so stay tuned. The new chat requires dedicated server, so we decided to keep the old chat for those still on shared hosting accounts. When 7.3 is fully released, we expect it to be offered with Premium+ and Business+ subscriptions (Advanced+ is on shared hosting, so it can't run Chat+ yet). It also requires secure connection, so SSL is essential. 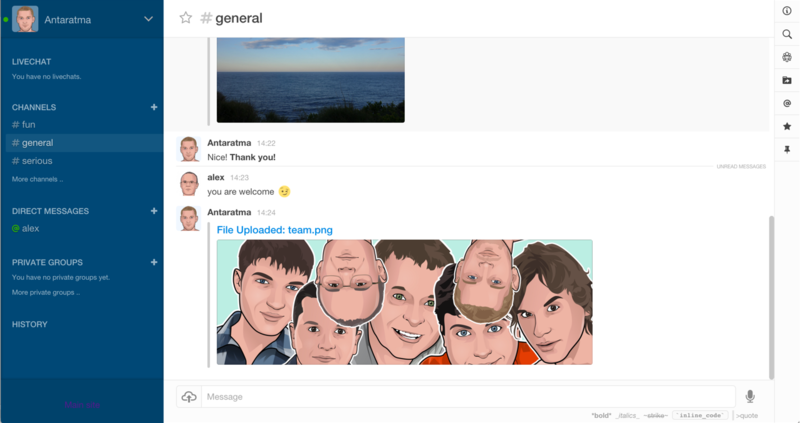 Chat+ supports public channels, private groups, direct messages and admin-guest helpdesk. 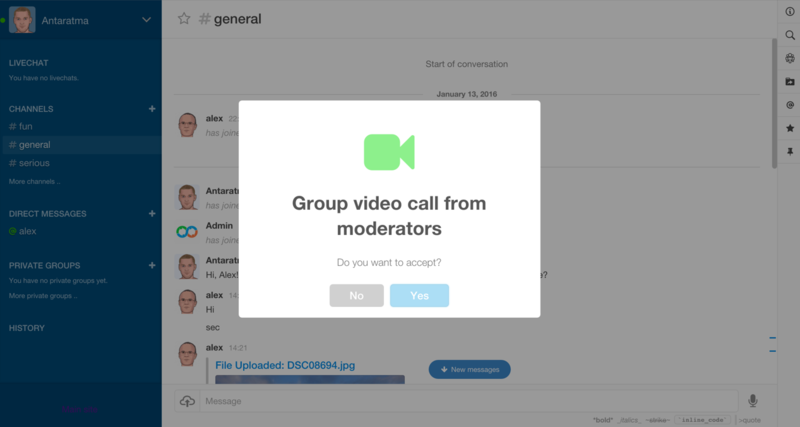 Video calls can be allowed for 1-to-1 direct messages, private groups and even public channels. WebRTC connects everyone peer-to-peer, so your hosting server isn't affected much. 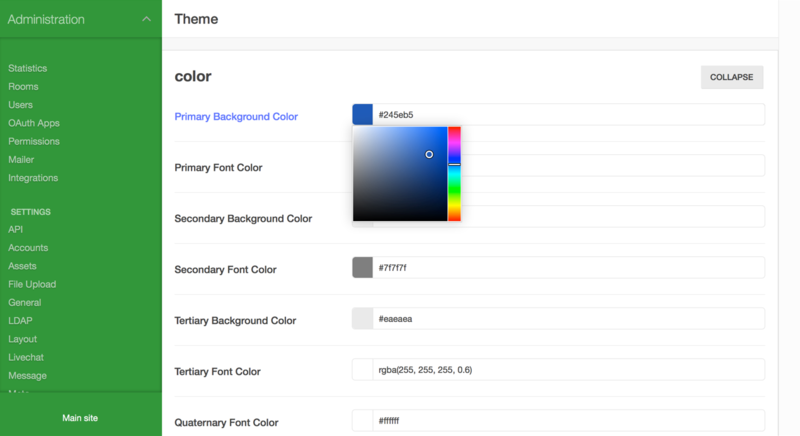 You can customise appearance and various settings through an easy-to-understand Admin panel. 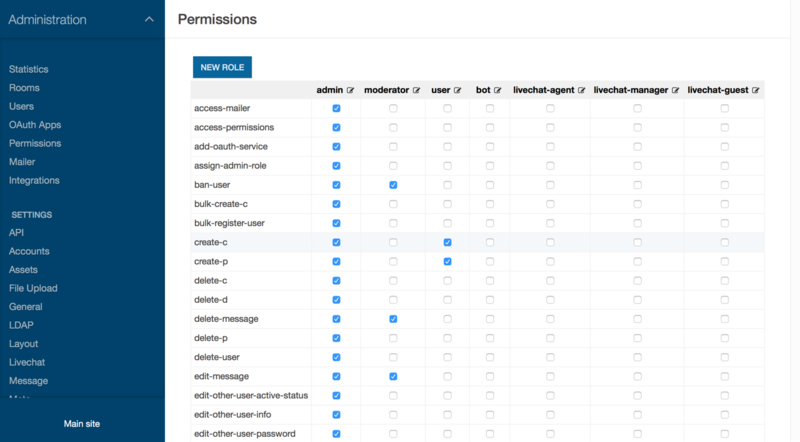 Permissions can be controlled for every action and user-type. HelpDesk chat shows how Chat+ can be integrated with DolphinPro. We plan integrate deeper and deeper with every iteration. 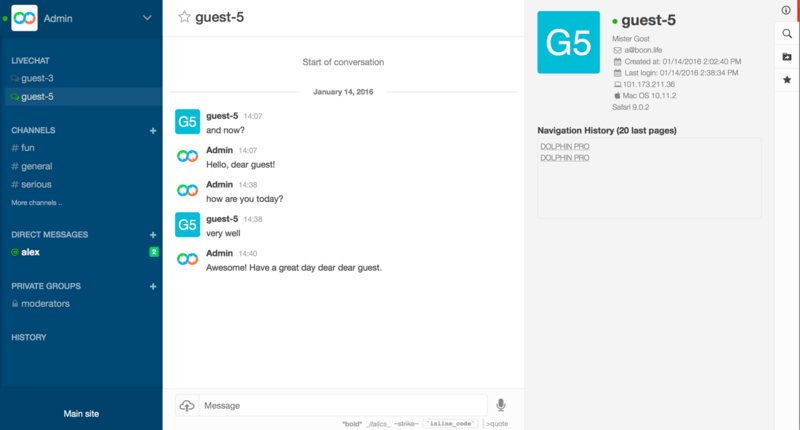 When Admins are talking to guests via HelpDesk, they can see navigation history and basic info about the guest. Audio-messages, video and audio calls, file uploads, text formatting, smilies, stars, pins, search - it's all there! Admins can kick users out of rooms or mute them. 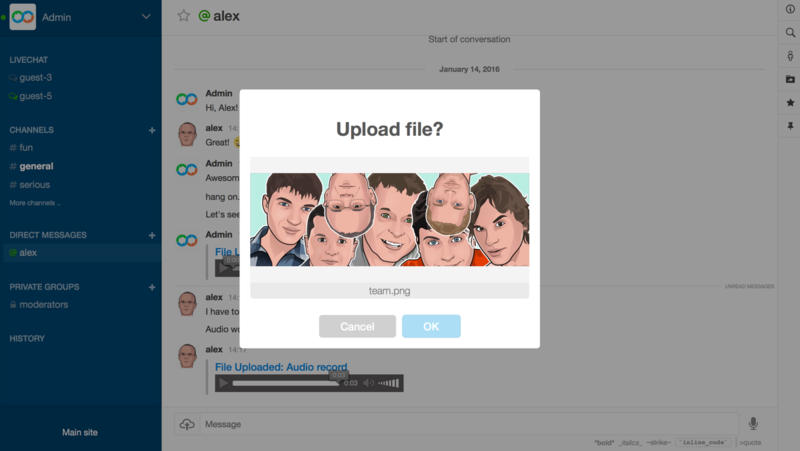 File-sharing is quick and simple - perfect for chat. Like I said, there's a lot more to talk about and talk we will. Stay tuned and watch DolphinPro marching strong! Tried to get chat + server going on windows = failed :( owell. Will try on linux i suppose. Side note - on your demo site should the chat+ module use the same user and pass as the demo site login. If so it's not auto logging me in. Like facebook connect you need the chat site to get permission from the main site to fetch users details. Something that was lacking in Dolphin , welcome! "WebRTC connects everyone peer-to-peer, so your hosting server isn't affected much"
And this is where the ball start to drop. Andrew, I dont know if this is something you can fix, or if this needs to be addressed with RocketChat. But for sites that are dedicated to mobile users, that will become a problem, if its very active. What I mean is most users are on 3g/4g connections at various speeds and various caps. Ex: If Im on 4g connection @ 3mbps with 5gb data cap, and if I were see more to do a video chat, and if 20 other uses were to watch my video chat, then the viewing experience will be pretty horrible because my connection cant support hosting a video chat with 20 users. Now if I were on pc with 50mb connection, and using a webcam, thats very much difference. But we're focusing ONLY on mobile users. So, with that being said, and IF possible, please add additional code to make this chat operate using the server bandwidth...everyone connects to the server so that users can videochat more effortlessly. OPTIONS Andrew, options! WebRTC itself and Rocket.Chat are improving very actively now. Multiple streams can be assisted with a 3rd-party server, and yes, the Chat already has settings that you can use to limit multi-stream videos. For example, you can allow them in one-to-one chats and private groups, but not in public channels. Just to be perfectly clear, are you stating that we, site owners can easily configure this chat to not directly be p2p by having our server use its bandwidth to handle multiple streams? Basically making it possible for one mobile user to stream their video to hundreds or thousands of other users very easily? For us that don't mind running a dedi and have the server power to handle the load, we would rather take the burden off of our users bandwidth. So is that possible with the new Rocket Chat thingy? Believe it or not, not everyone on the interweb have huge pipes with unlimited data transfers. Yay I love it! I love WebRTC. I was the first one to mention it in the Boonex forums because I love it so much! WebRTC is by all means THE standard for all future real-time communication web-apps. It's backed by W3C and unlike Flash it is supported by mobile browsers. Also JS-based front-end makes cross-platform deployment really easy. How much time before a possible installation ? About a week or two, depending on how beta goes. Not at the moment, but we are definitely looking forward to doing that. Super!! Chat+ is very good!! Video with Subtitle build?? Subtitle for deaf!! Is there a guest user feature? I need there to be a simple feature that let's anybody and everybody use the chat+ will all permissions enabled without logging in or signing up for my site. And also, I need a way to make chat+ be on the homepage so the first thing people see is the chat+. Extra features and deeper integration will be added gradually. It's long term pairing, which is only going to improve. Right now guests can use HelpDesk only, but we'll be looking into more options for the main chat. It happened after my hosting guys said they are repairing all sites databases, and soon as they got see more done, my site started showing: Fatal error;Call to a member function getClassPrefix () on null on home/my ftp username/public_html/templates/base/scripts/BxBaseSearchResultSharedMedia.php on line 121. This new chat+ looks great so far. I'm Looking forward to it's release with 7.3. This chat is possible to share member computer display too? This has a really Clunky feel within Dolphin. I'm sure that performance wise, it will be OK, but the whole user interface experience is plain awful. I hate it on multiple levels. The sidebar menu is counter-intuitive... I find myself staring at it, wondering what to do next. I think you folks at Boonex probably jumped the gun on this one, because it just doesn't have the polish a commercial product should have.